February 2016 – Oh Man, Oman, Man! Hello everyone, I’m alive! And a few weeks behind. I have had little to no internet access in my apartment and have been relying on a data plan I purchased for my phone for wifi here. Luckily today I have enough data to add another post. I’m quite behind on the blog, so here I’ll talk about my weekend trip on February 12 to a small village near Ibri. We started the day with a visit to a farm – it was quite refreshing to be surrounded by green trees and grass with shade overhead because I don’t see too much of that usually in Oman. We started with a nice little breakfast (in the first photo), walked along a falaj (an Omani aqueduct), and then went to look at the fields. I know for a fact that wheat and onions were grown there but I don’t remember much else. It’s a bit harder for me to remember information when it’s told to me in Arabic! A mosque specifically for funerals. A worker manually pollinating a date palm. I also had the experience of tasting the worst taste in my life during that trip. I tried just a small bite of a little melon-like fruit that Masoud picked from a vine on the ground. According to him, this fruit is very good for you, but I have a feeling that one of the prevailing thoughts around here is “bad taste = good for you.” The taste was quite odd – it was a gross bitter taste, but it lingered for a long time in the same way that something that is very spicy stays. It was like the sensation of spiciness but with a bitter taste, which I didn’t think was possible! One of the students in the group did like it though, so maybe the fruit isn’t universally hated. The other two students who tried it agreed with me, however. Me with Masoud – he posed like this without me asking. The strangest fruit I have ever tasted. We finished with an excellent Omani lunch at Masoud’s house. As is the Omani style, we ate with our hands. In my next post I’ll talk about the two trips in the following weeks – visiting a castle and a mountain village, and a trip to the same desert I visited last summer. Well, it’s been almost a week since I arrived here and I already have a lot more to talk about than will fit into one post, so in this post I’m just going to talk about what I did before the weekend. I’m staying in the city of Ibri in the Ad Dhahira government. I am studying at the Noor Majan Training Institute, taking classes focusing only on Arabic five days a week. The classes are split into five week sessions, and I will be here for three of them (session beginning in April is a little longer). I have a very nice apartment this time located in the city, right next to the biggest mosque in Ibri, the Sultan Qaboos Mosque. Ibri is actually a pretty big city, I’d say bigger than Greenville. It’s hard to say because the way the buildings are arranged here really isn’t that comparable to at home – there’s not really a distinction between city and suburb. There is a Syrian restaurant that has very good falafel and hummus about a walk away, and there’s a Turkish restaurant nearby along with a bakery, too. Unlike the other program I was in, I’m able to leave my apartment and go wherever I’d like to. In fact, I can even rent a car through the program if I want to. I think it will be a little while before I feel comfortable enough to drive here though as the roads can really be crazy. Also I’m not really used to roundabouts, which are standard here. 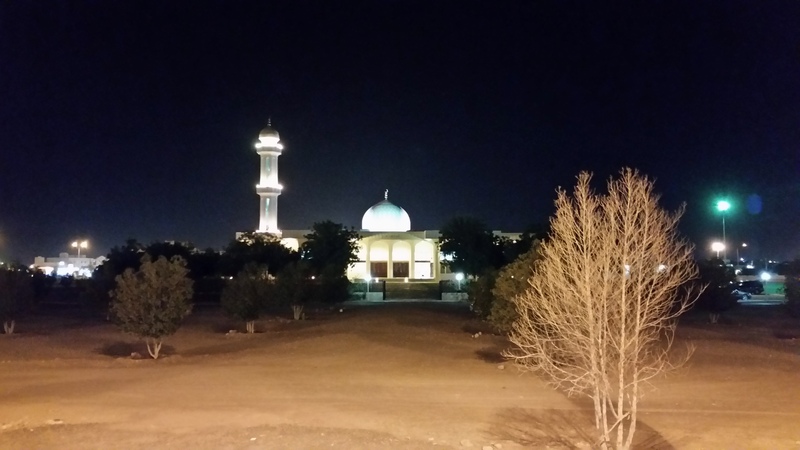 The Sultan Qaboos Mosque in Ibri – right next to our apartment. Tuesday, after I arrived, we just rode in a van together from the airport in Muscat to Ibri, where we stayed in our apartments and rested for the remainder of the day. All of the students went out for dinner at a Lebanese restaurant, and we got to know each other. Surprisingly, I’m the only American here! There are only six students other than me – one British guy, one German guy, one Colombian guy, two Swiss girls, and a German girl. Everyone speaks English well, and we all have different skill levels in Arabic. Everyone is very nice, and I think I’ll have no problem being around them for the next few months. Some of them are only staying for this class session, and others are staying longer than I.
Wednesday we had a little tour of Ibri. We started the day off with a visit to the goat auction in Ibri’s Old Souq – unlike other animal auctions in Oman, this auction occurs every day! We also visited a date store and had some candy made from dates and coconuts with Omani coffee. I had always wondered why Omani coffee was so different and so light, and it turns out that’s because its actually made with date seeds. We went saw the Ibri castle as well, where the governor of the city would have lived over a hundred years ago. That was cool because we were able to climb to the top of the tower in the fort using some ladders built in to the corners of the rooms in that tower. Getting up there was much easier than getting down! We also learned about Ibri’s history, for example that it was once a stopping point for caravans crossing the desert. Sultan, the director of our program, said that as little as forty years ago caravans were still stopping in the parking lot we arrived at to stock up for their trips across the desert. In fact, Ibri’s name comes from the Arabic word “to cross”. A baby goat at the auction! A male palm frond used to manually pollinate date palms. After the little tour of the Souq we went to the Noor Majan building – which happens to be right in the middle of the Souq! We took a short placement test, and had lunch at the institute, which for me was just some Omani rice with lentils, which was of course very good because it was homemade. Then we went back to our apartment to prepare for the first day of class. Thursday was our first day of class. We were divided into three groups, and I am in a class with only one other student – Tom, the Briton. He’s definitely much stronger in Arabic, but that’s because he’s been here for a month longer and was living with a host family before I arrived. Otherwise we’ve studied Arabic for about the same time. We have about four and a half classes total in Arabic, divided into sessions with two different teachers. The first focuses on grammar and reading, and the second on discussion. It was really very draining by the end, as I felt I had reached my capacity for new vocabulary. I think I’ll get used to it and get more comfortable with the schedule, but for now the amount of time I’m going to spend in class seems pretty daunting, especially with how little I’m able to understand of what I read and what I hear. But I’ve only been in class for two days, and I’m sure it will get better as my vocabulary improves. A typical Omani style house. I’d say that this one is a little more ornate than usual. Well, it’s been a while. And I regret not adding a closing post to the other blog sooner. I figured this blog would be for my Oman trip last summer, but I liked Oman so much that I decided to return this year for even longer! So now this blog is going to be about my two different trips to Oman. Closing the SALAM Scholarship – I think I still have one more video to add, but I don’t have a good enough internet connection to do that so it will be a little out of order. I had a lot of fun on that program, but because we were only there for a little over a month, because we were in a highly structured program with trips every weekend and events every night, and because I was in a group of Americans never allowed to leave our Guest House and explore Oman on our own, I feel that I didn’t fully experience Oman like I had hoped to. I never got to go have dinner with an Omani family, for example. Plus, because Arabic is such a hard language to grasp, I felt like I was only nearing a breakthrough as I was leaving. It was a great program, those were just the few flaws. But the benefit of that was that it left me wanting more, and gave me a good introduction to Oman. If I hadn’t done that SALAM program last summer, I would definitely be too afraid to do what I’m doing now – flying alone to the other side of the world. First and foremost, what must be documented: I cut my hair off! I think this is the shortest it’s been since before I was in first grade. I was tired of it being a big frizzy mess, so I decided I wanted to try something different. The timing lined up well with the trip, and it’s easier to deal with while traveling. I did not cut my hair to improve my job opportunities or to make me more approachable, to be more professional, etc. I just wanted to do what I thought would look best. So, this time around I’m going back to Oman and taking classes at a similar school, called the Noor Majan Institute. It’s in Ibri, a city that’s a few hours west of where I was before. It’s pretty rural, so I think that I’ll have to rely on Arabic, which is good. I want to be close to fluent by the time I go home. Right now I’m sitting in Muscat, waiting to meet with whomever else is in my group to take a bus to Ibri, which is a few hours away from this city. I started with a short flight in Greenville to D.C., had a 7-hour flight to Frankfurt an hour after that, another 7-hour flight to Dubai an hour after that, and a 45 minute flight to Muscat from there after a four hour wait. I’ve been travelling for over 24 hours, and I actually feel much better than I thought I would. I think I’ll be able to avoid jet lag. On one of the planes – my mom sewed an Omani flag patch that I got last time around on one of my hats.